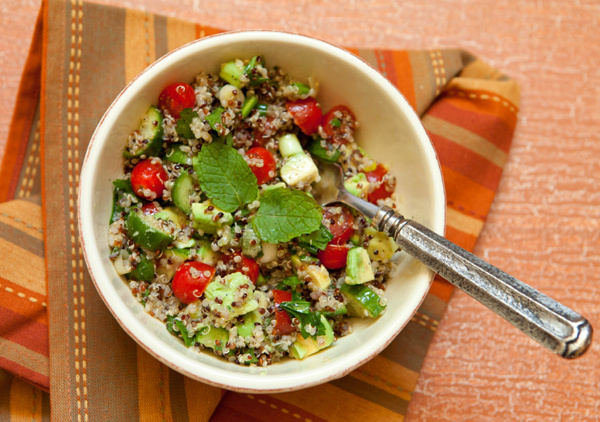 If you haven’t jumped on the quinoa bandwagon yet, this salad might be a great start. Quinoa has been cultivated for thousands of years and although it is often categorized as a grain, it is actually the small seed of a plant in the same family as beets and spinach. The seed is disc shaped with a band around it that becomes obvious once it has been cooked. It is a fast cooking grain and can be ready in about 15 minutes. Unlike most grains, quinoa is considered a complete protein containing all the necessary amino acids. It is also a great source of fiber, and a decent source of iron, magnesium, calcium, vitamin A and vitamin E.
Quinoa is a very versatile grain and can be used as a breakfast cereal, tossed into salads, stirred into soups or baked goods, and even formed into patties. Quinoa is now readily available in many grocery stores and comes in a variety of colors. The quinoa I used here in this salad is a mixed color combination sold together. This salad is one I make often, using different ingredients depending on what I have on hand. In this version I used cherry tomatoes, green onions, cucumbers, and avocados, along with a bunch of chopped parsley and mint. In the past I have added edamame, chopped red peppers, or canned chickpeas to this salad as well. Pine nuts or sliced almonds are also great additions to this salad. Put the broth and quinoa in a pot and bring to a boil. Reduce the heat, and cook covered over low heat, stirring occasionally for 15 minutes. Remove from the heat and allow to come to room temperature. 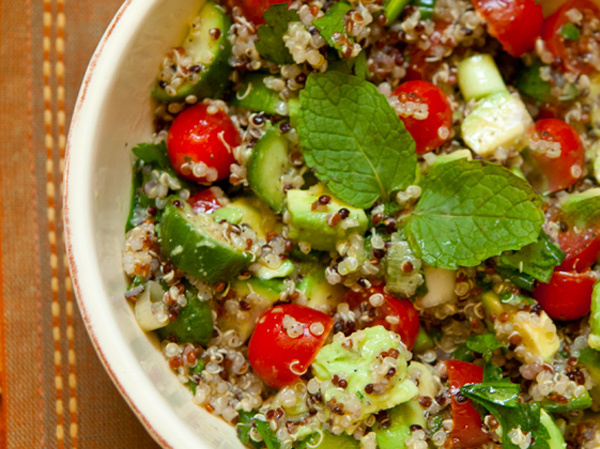 Place the quinoa, tomatoes, onions, cucumber, parsley, and mint in a bowl and toss well. In a separate bowl, whisk together the dressing ingredients, and pour over the quinoa mixture and stir to mix.